In this part of my Qt Video Tutorial I’ll cover how to make numerous charts. We’ll make two types of Bar Charts along with Pie and Line. 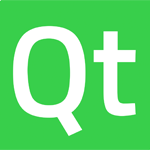 I’ll also cover numerous attributes associated with Qt charts. All of the code follows the video below. I did my best to structure it as a transcript as well. Feel free to use it as you may. If you like tutorials like this, consider donating $1, or simply turn off Ad Blockers. Either helps me continue to make free tutorials for all.